You'll win them over with this sunny bouquet! Our floral experts have combined lovely two-toned peach roses with stunning Asiatic lilies in brilliant white and set them against a dramatic backdrop of verdant foliage and wildflowers. 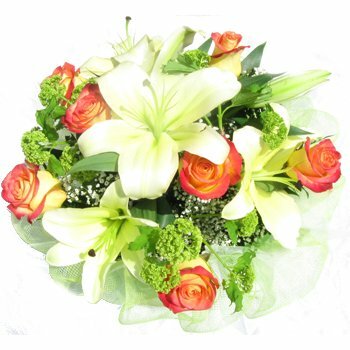 Send your love, your sympathy, or your welcome home message with the Peaches and Cream Bouquet.